All of the best plastic sheds have one thing in common – they are designed for a specific purpose. The fact that they are also made of plastic, means that they are easy to clean. Included windows also mean that they are light and airy. In most cases, your best plastic garden storage is made out of high density, high-quality material that is also UV resistant and designed to blend into an outdoor garden setting. When looking for the best bike shed or the best outdoor storage shed, you probably have your specific needs in mind. Are you looking for something in which to keep your garden tools or just an extra storage space for your Christmas and other decorations? Whatever your needs, size would matter, especially when taking your garden size and décor into consideration. 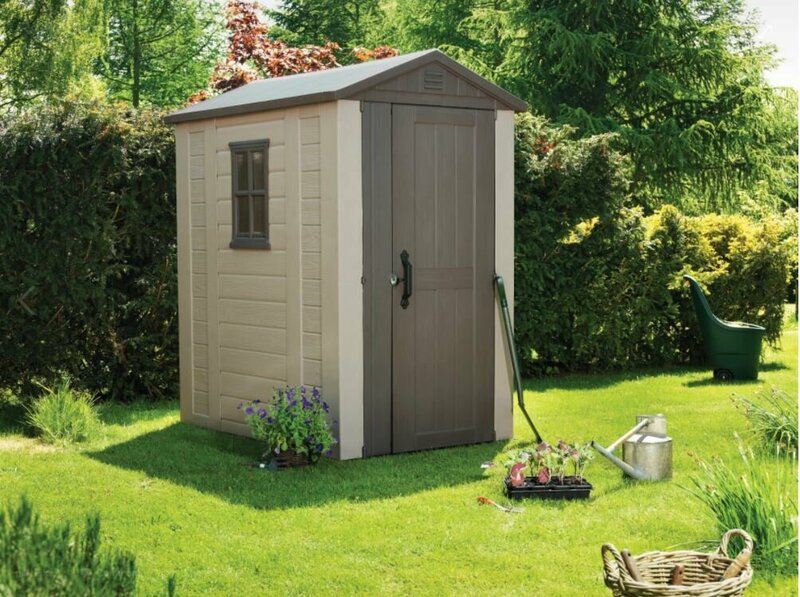 A product designed for functionality, this may be one of the best plastic garden sheds to consider if you need to keep your tools safe and sound. Also, the gable design of the roof is in keeping with a more traditional style. This shed has two windows, a skylight, and great ventilation. 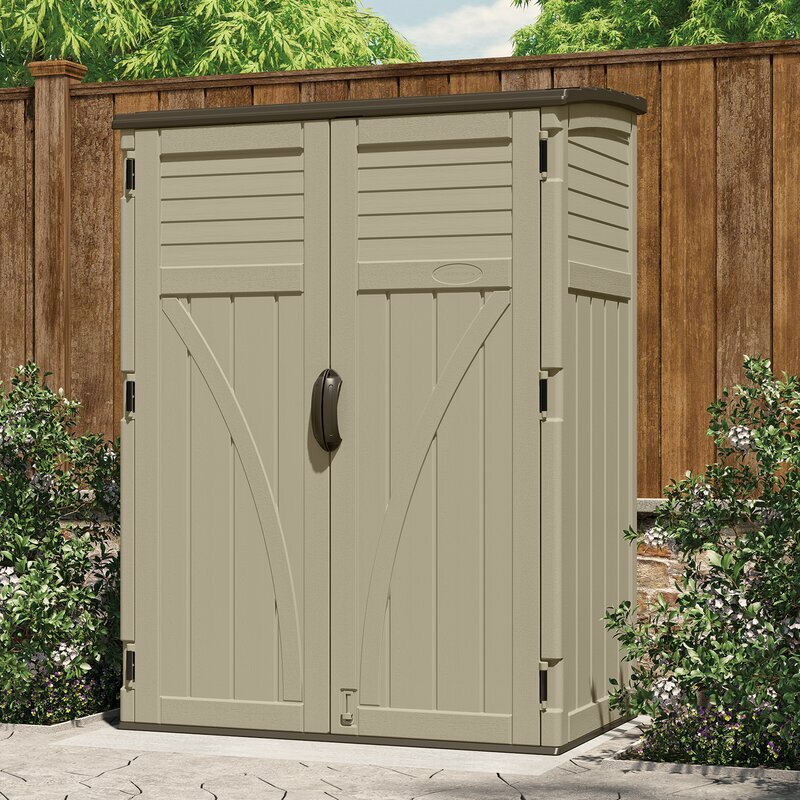 Add to that a storage capacity of 547 cubic feet, and you have a space for all your gardening or storage requirements. A storage shed with lockable doors and that withstand a wind rating of 55 MPH means safety under most conditions. Add to this the fact that it is weatherproof and UV protected, and you may have an outdoor shed for years to come. 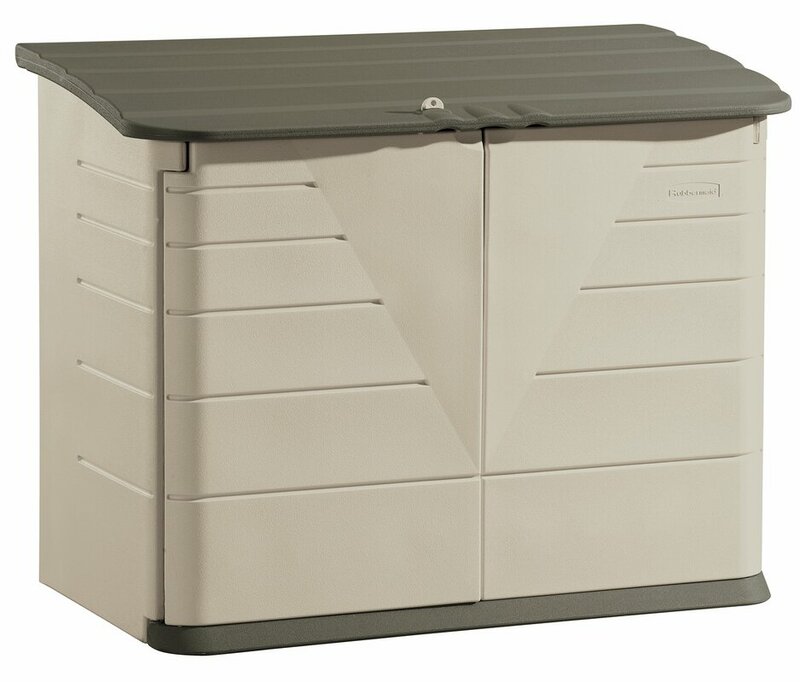 The WoodBridge plastic storage shed has solid metal reinforced wall columns and a foundation. Due to the metal reinforcing, you can hang either shelves or garden tools easily. As this storage shed is made of durable polycarbonate, it is virtually indestructible. It has an extremely high impact resistance, meaning it will not crack, warp, or discolor, no matter the temperature or weather. 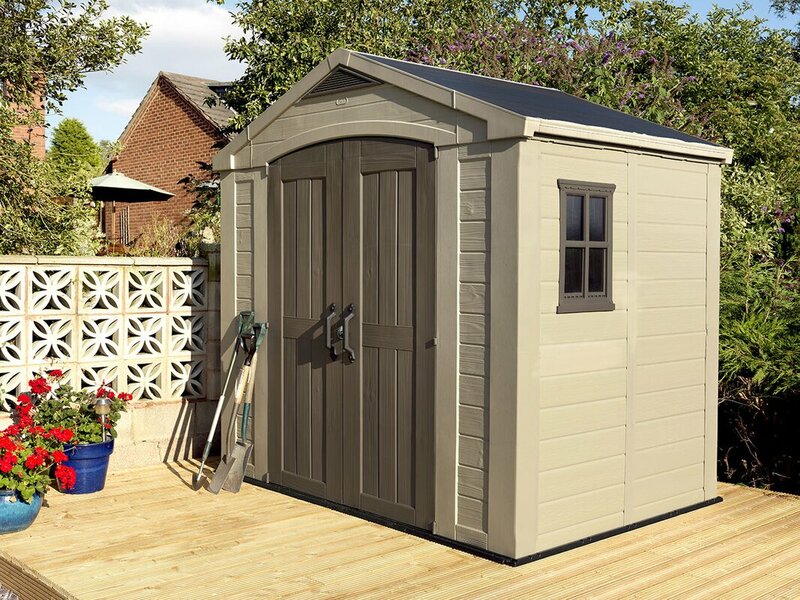 The skinny design of this plastic tool shed is ideal for the smaller garden or where space is an issue. But it still packs a powerful punch when it comes to adding extra storage space with its 52 cubic feet storage capacity. 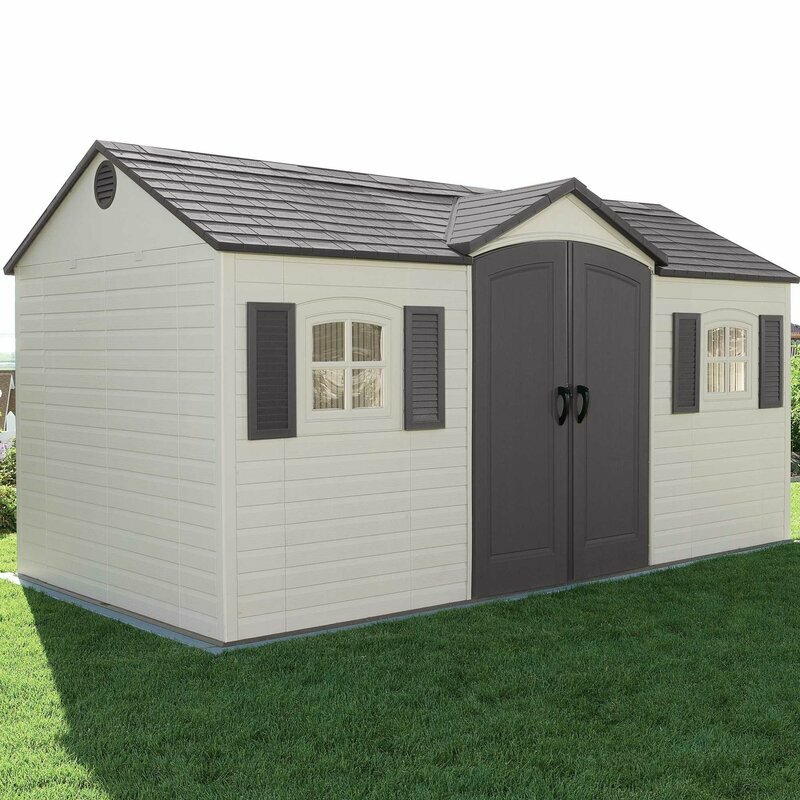 Compact, yet spacious, this shed is great for a small yard space while being able to withstand most weather conditions. A plastic horizontal garbage shed that is constructed out of polypropylene resin that will give you years of use. 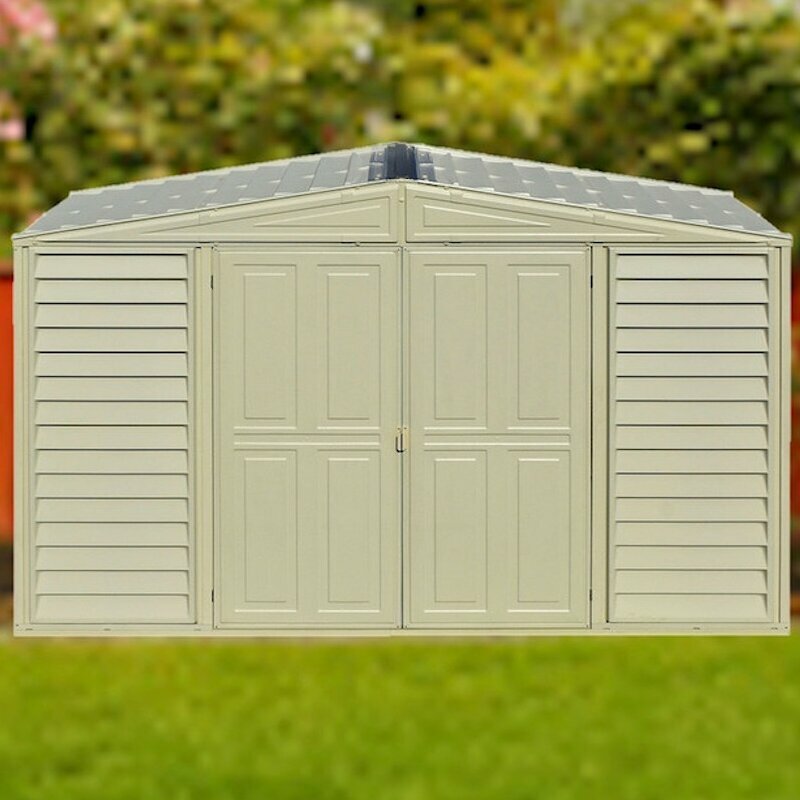 A small shed that is large enough for storing lawn and garden supplies, cushions, and even bicycles. 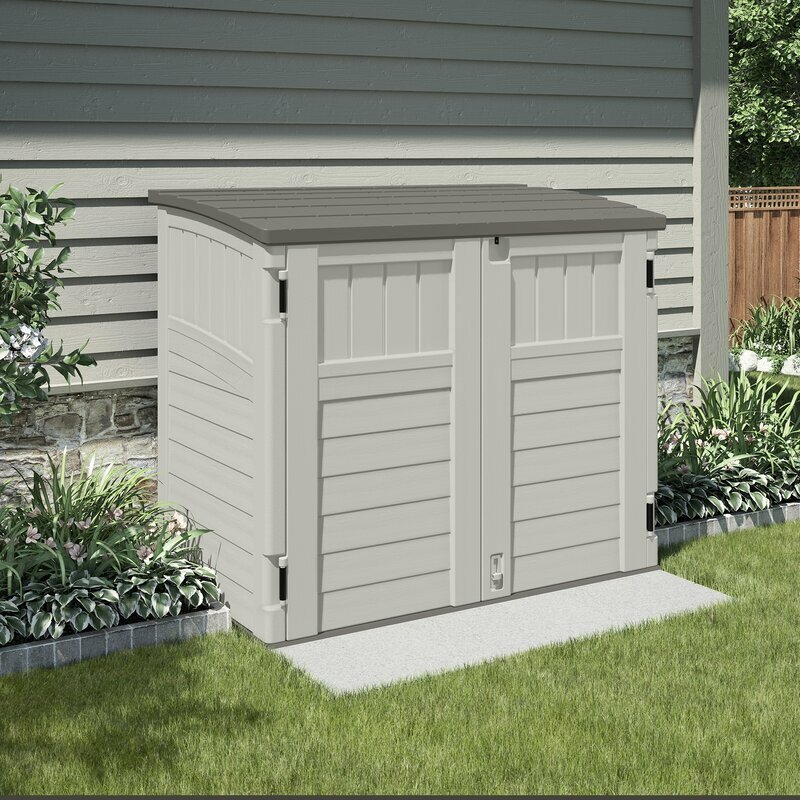 Because of the low profile, this shed is easy to place under a fence, on a patio, or next to your house. 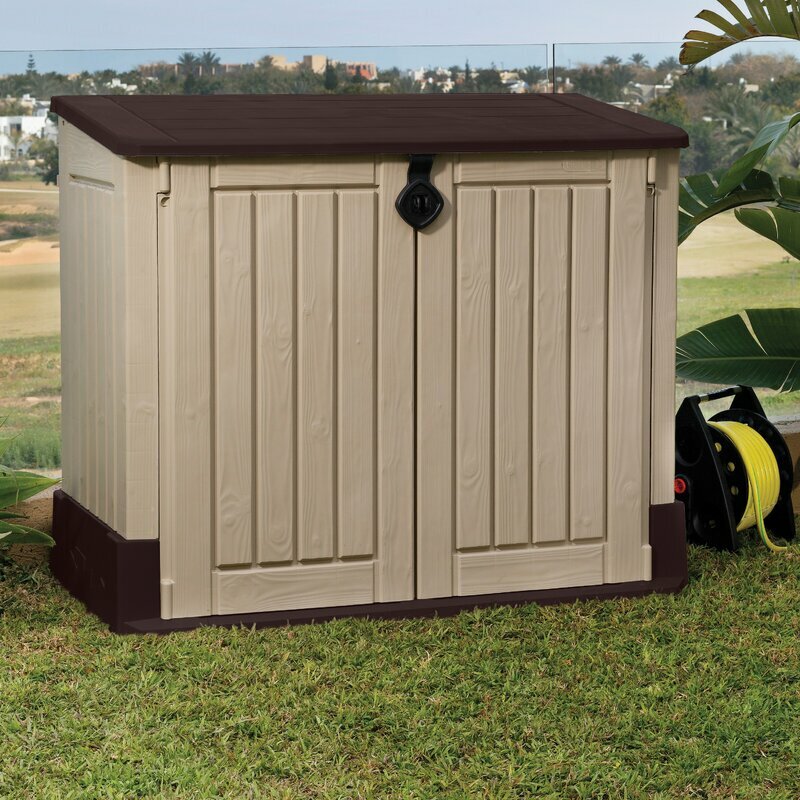 This horizontal garbage shed is a heavy duty product with an impact resistant floor. Everything in life tends to have an up-side and a down-side. The same goes when it comes to anything made out of plastic. But then, again, it does depend on a number of factors, such as the different components found in the specific plastic product. One of the plus points when it comes to a plastic storage shed is that there is virtually no maintenance if any, that you need to concern yourself about. They do not rot, and they do not rust. You never have to paint them or treat them for any kind of pest infestation. You don’t even need to sand them down in order to repaint – unless you absolutely feel the need to paint your shed, of course. And cleaning is easy! All you need is some soapy water, a stiff brush, and some elbow grease. A pressure washer also works great on this type of product. A wooden or metal counterpart, on the other hand, requires you to keep them in good shape if you want them to last for a long period of time. Metal, if not looked after, will rust, while wood, on the other hand, may rot. Plus you need to make sure to paint or treat these materials in order to protect them from the wind and rain. When it comes to weather resistance, plastic sheds also tend to pass with flying colors. They are impermeable, meaning that water cannot soak through to your stored valuables. They thus keep whatever your store inside dry, and safe. The weather, whether sun, rain, sleet, or snow, makes no impact on plastic sheds, especially considering the more advanced plastic materials they are made from these days. While plastic sheds got a bad rap when they just came out, those made today are manufactured using the latest technological processes and upgraded plastic materials. This not only means that they are long lasting, but it also gives them a competitive edge in those areas submitted to lots of water or runoff, as plastic effectively insulates anything on the inside of your shed. Let’s face it – the plastic sheds built today look good. In many cases, much better than their home-built wood or metal counterparts. Their neat appearance and sturdiness improve the look of your property in general, and your garden in particular. Plus, they add a lot of extra storage space as well. Generally speaking, these sheds tend to be priced quite well. They also give you a whole lot of extra storage space. Do remember, though, that while many of them may need you to put down a foundation, some do not need this, as long as they are placed on a level area of your garden. Also, remember that they all come with a floor included. You no longer have to worry about any water seepage from the bottom. Most plastic sheds are delivered to your door in a kit form. Luckily, you do not have to have much building experience in putting them together. Doing so is relatively simple. They usually arrive in large panels that you simply need to put together, many times just by snapping everything into place. It is as simple as that. Plastic sheds don’t really have many cons, except perhaps that of safety. Many people are worried about having a plastic shed in their backyard, feeling their belongings might be a little exposed. Many plastic shed manufacturers, however, have overcome this concern by adding a feature that makes them easy to lock up by means of a simple padlock. You would, however, need to ascertain for yourself how strong this feature is and how much pressure someone would have to put on the lock for it to break. 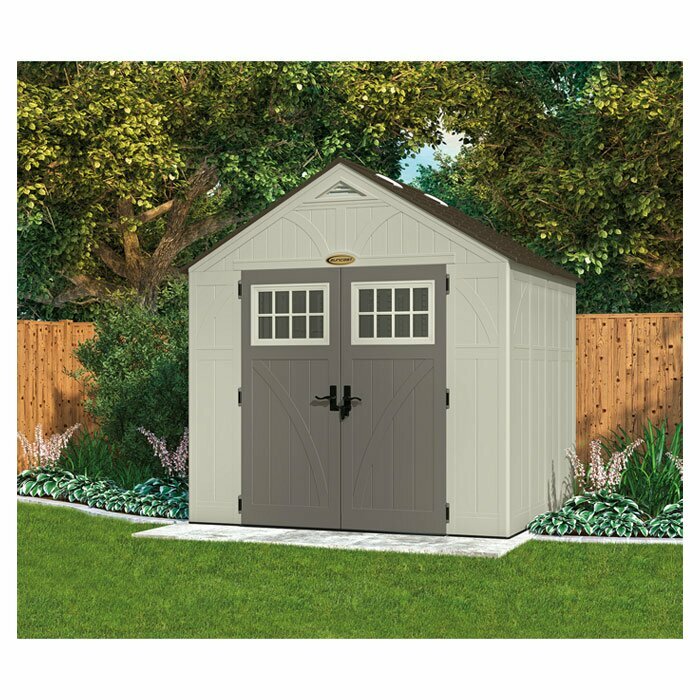 Many sheds are steel reinforced, and some even have steel locking mechanisms. If safety is your main concern, we advise you to take a look at these aspects before deciding on the perfect shed for your requirements. Plastic sheds, in general, offer the homeowner a safe, affordable, and stylish way of putting their gardening tools or even outside cushions away safely. It all depends on your particular needs, and space. 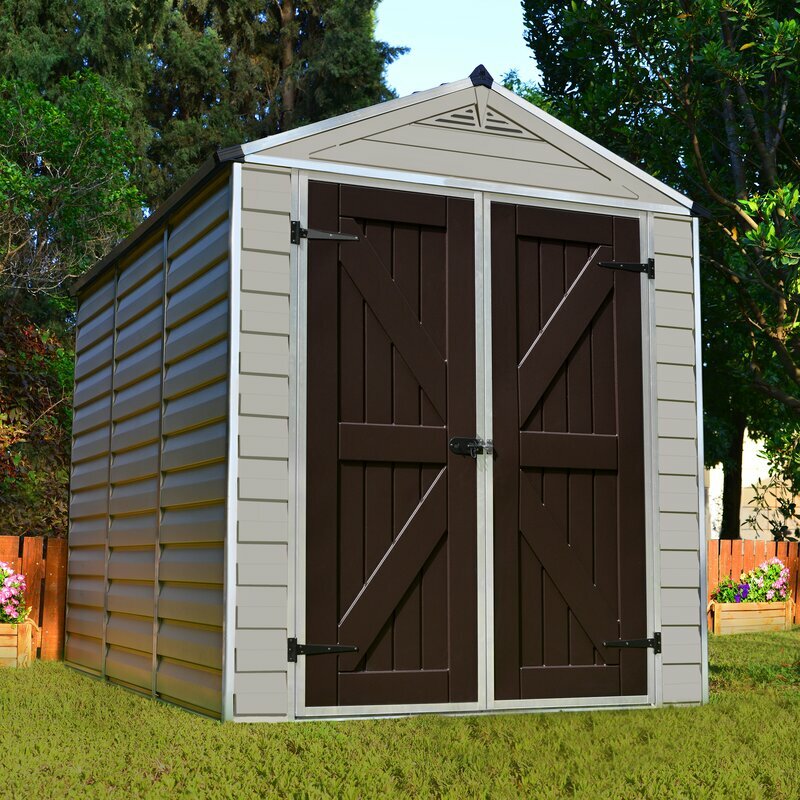 Going through our list of best plastic sheds reviewed, we have opted to pick the WoodBridge 10 ft. 5 in. W x 5 ft. 2 in. D Plastic Storage Shed by Duramax Building Products as our overall favorite. We liked that fact that it is tall, has wide double doors, and that the metal reinforcing makes it not only structurally strong but allows you to easily hang shelves and garden tools.